Speed, Range: 21 knots, 9000 miles at 15 kts. The contract was signed on 7 May 2015 during the IDEF 2015. The delivery scheduled for 2021 but this might shortened. The construction has started on 30th April 2016. When completed she will be the largest warship of Turkish Navy. Unlike her nears sisters in Spanish and Australian navies the Turkish ship will only have diesel engines. There will be five MAN 16V32/40 engines each creating 7680kW and propelling the ship up to 21 knots. The range is estimated to be 9.000 nautical miles. The details on weapons and sensors may change during the course of construction. Turkish companies will provide ECM and ESM systems, IR signature measurement systems, electro-optic sensors, torpedo defence systems. The combat management system will base on GENESİS CMS. 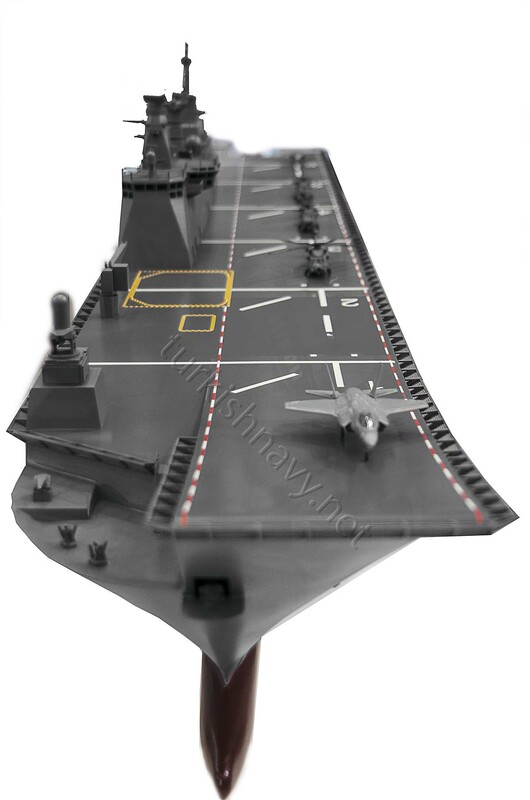 The flight deck will 170 meters long and 32 meters wide and will feature a 12 degree ski jump. The hangar will have an area of 900 m2. The upper garage where the heavy vehicles will be parked will measure 1.410 m2 and lower garage for the light vehicles will be 1.880 m2. The dock will cover 1.165m2 and two LCAC’s or four LCM’s will fit in. She will have a 34 bed hospital on board.